Welcome back! Last month, I talked about the design context in which Modern currently exists. As promised, this month we’ll be talking about modal spells. Snapcaster Mage is secretly a modal spell, and we should be designing more secretly modal spells like it. What is a Modal Spell? This is going to sound like a very silly line of questioning, but it’s important we ask ourselves what precisely makes a spell modal. Obviously, you have to have a choice between multiple different effects, but lots of cards do that. Lightning Bolt, Richard Garfield’s most beautiful gift to the game, in a way has three ‘modes’. It’s somewhat interesting to think of it this way, because decks like Burn work hard to make the player ‘mode’ into a real choice, but this isn’t the limit to which we could think of spells as modal. Arguably, Murder is a modal spell if your opponent has two creatures on the table, with ‘kill creature A’ and ‘kill creature B’ as the two ‘modes’. Most people would reject this, because at that point any card that makes you choose anything is a modal spell, but we can go a step further. If a person is extremely pedantic, they might argue that any X spell is a modal spell, because any value of X is a different mode of the spell. If they were being as pedantic as humanly achievable, they might argue that every spell is modal, because a Mind Rot on turn three is a different mode from the same Mind Rot on turn four. This is subjective, but for me the definition of what makes a card modal is having ‘different’ uses. 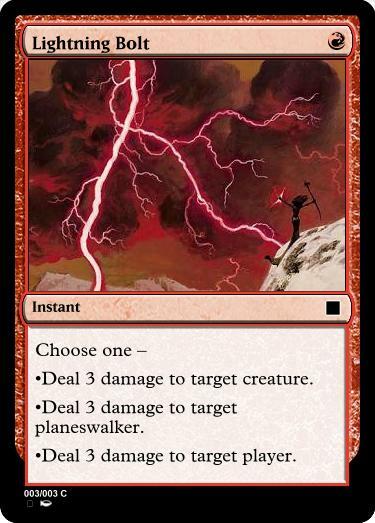 I think Lightning Bolt is at least a little modal because it gives you the choice between ‘destroy target fragile permanent’ and ‘push the game closer to ending.’ If modality is a spectrum from obviously modal spells to absolutely not modal spells, that’s where I draw the line, but it's fine if your own personal definition is different. I’m going to spend most of this article talking about your classic, bullet-pointed-list style of modal spell. When I switch to talking about things that don't have "Choose one" in their Gatherer text, it’ll be with a very clear justification for talking about those cards. Hopefully, every card we dig into will feel modal, or at least be closer to ‘real’ modality than Murder, Mind Rot, or Blue Sun’s Zenith. Obviously, that would be terrible. You’d never use that mode, and the mere fact it was printed on the card would make you spend mental energy thinking about this useless, pointless mode. Worse, that mental energy would come out of your brainpower budget for playing Magic in the first place. There’s a term called ‘analysis paralysis’; if you have too many options, you can’t choose between any of them, and either choose at random or just give up. Adding useless choices like this one increase the odds of reaching the point of analysis paralysis, especially because printing text like that on a card sends a message to your player that there’s some reason for this second mode to exist. On the surface, this seems like a valid criticism, and at the core there’s a very good point about outright useless modes, but I now think that this sort of thought process can lend itself towards eliminating bad modes that can actually be very meaningful. In order to highlight that, let’s talk about a game of Modern I played. The game was Burn vs. Affinity, back when Naya Burn was the most common composition. I had two Monastery Swiftspears and a Goblin Guide. My opponent had a Vault Skirge, two Ornithopters, a Signal Pest, a Cranial Plating attached to the Skirge, a Blinkmoth Nexus, and the mana to animate the Nexus, equip the Plating, and move that Plating at instant speed. Letting everything through, I would die. And letting any Plating creature through I would be dead in two turns, even if I killed off most of their artifact creatures. My opponent had enough life from a previous Skirge hit with the Plating attached, so I wasn’t going to burn them out in that timeframe at all. In hand, I had a basic Mountain, an Atarka’s Command, and a Searing Blaze. I took that board state from me being dead in two turns to me four-for-two-ing my opponent and winning that game. How? The last two modes on Atarka’s Command. For those who haven’t sleeved up A-Command, the reach in mode 4 and all of the text in mode 3 are mostly flavor text. I gave all my creatures +1/+1 and reach, and blocked the Pest, a Skirge, and the Nexus, I also dropped the Mountain. My opponent went to instant speed move the plating to a ‘Thopter, and I Searing Blazed it with landfall. I went from being dead in 2 turns to fogging a whole attack, leaving my opponent with one creature, and winning that game off the back of the two least likely to be relevant pieces of text on Atarka’s Command. So, what does this mean? I didn't just tell that story to brag about being very good at casting burn spells. What should we take home as designers about that play? Let’s talk about Timmys and Spikes for a moment. Timmy likes momentous, dramatic moments in gameplay. Stereotypically, they like expensive cards, because expensive cards always feel super cool to resolve, but any big moment can be a Timmy moment. Topdeck Lightning Helix is incredible, and as a moment in a game it feels incredibly cool. A crazy play using a random, half-forgotten mode can make you feel something, and Timmy plays the game because of the way it makes them feel. Spikes like using the game to demonstrate mastery. They want to show the world that they’re good at Magic. Using an obscure mode in a way people don’t expect is a powerful show of mastery and understanding of the game. These provide a strong way for a Spike to show themselves to be a more thoughtful player, and use that thoughtfulness to steal victory from the jaws of defeat. Outright useless modes are bad. That said, obscure modes, even 'bad' modes, especially on modal spells with 3 or more modes, seem reasonably good in moderation. They can serve a real purpose as long as the other modes on the spell do the heavy lifting of providing reasons why that spell ought to exist. Additionally, it’s important to consider the fact that some obscure modes exist in the context of an environment in which they were designed as pressure release valves. Let’s imagine a Kaladesh Standard environment in which some of the more busted artifacts didn’t exist, or weren’t as strong. In that context, we might ask ourselves “Why does Abrade even have the artifact hate mode?” In that reality, we wouldn’t see the work Abrade was doing because its Shatter mode was designed in anticipation of a Standard environment that never came to be. One thing that’s been mostly skimmed over in this previous conversation is choosing which cards and which effects to be modal, and which effects to push hardest on a modal spell. One design fixture that’s seemed most clear to me in recent design is the modality on otherwise braindead Red spells. Atarka’s Command, Boros Charm, and Abrade stand out as cards whose most frequent use cases are extremely obvious, but that add a fair bit of nuance by being modal. 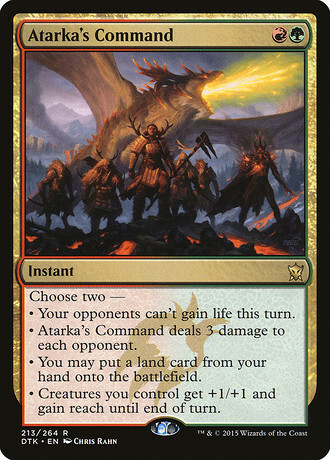 Skred, Shivan Fire, Flame Rift, and Lava Spike tend to have little enough decision making in the existing effect that you have a lot of free space to work with when it comes to adding modality. I think it’s commendable that these sorts of design choices can lead to effects with very clear use cases still being interesting the next time they’re printed. From there the question becomes “What effects don’t feel like they have enough choice, and what should we staple to them?” Both of those are very interesting questions in my mind. Mind Rot stands out as an obvious example of an effect that stands out for this sort of treatment. You Mind Rot either on turn three or when your opponent gets to two cards in hand, and if you draw it late enough it ceases to be a card. If I were printing cards right now, adding modality to a Mind Rot effect would be one of the things on my short list. Alright, I’ve saved the best for last. 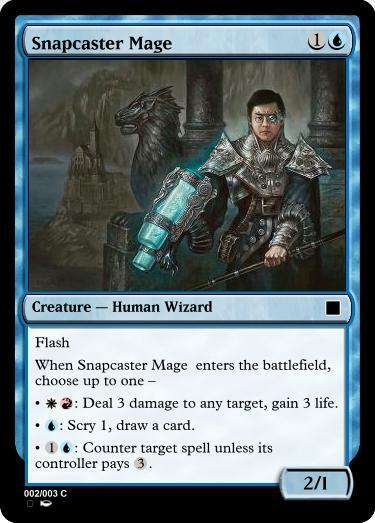 For those of you who scrolled down to the picture of Snapcaster Mage, welcome aboard. For those of you who slogged with me through the last thousand or so words, you’re smart and beautiful and I love you. Let’s talk about Snapcaster. One of the biggest level ups any Modern control pilot gets is when they realize that a late game Snappy targeting a Cryptic Command should often be cast with one of the modes being bounce Snapcaster. This surprises most newer players, because the draw mode seems like the best case. The level up here comes from realizing that you’re essentially drawing any card in your graveyard when you bounce Snapcaster, albeit with an additional 1U tax on top. Now, that last line dances around the subject of what specifically I’m talking about here. Imagine for a moment that you were reading a card that what Snapcaster does, but written out like a charm. What would that look like when your ‘yard is pretty full? If we think of Snapcaster as a modal spell, which it behaves a lot like, then as the game progresses the modes that Snapcaster has can fluctuate, and the question of which modes to use when becomes beautifully complex. Should it be a bad Ambush Viper? A better Merchant of Secrets with flash? A blue-red Flametongue Kavu with a worse body but a variable ETB? A Mystic Snake? A 6 mana Wrath of God? It might be any of these, or you might have to wait or work to unlock the mode you care about, or you might need to wait because you want it to be a superposition of several modes until you can pick one. That Cryptic-bounce-snap play is very frequently right for two seemingly contradictory reasons: 1) Because you might want to play snap to play a specific spell in your ‘yard again, 2) Because you might want to hold snap to be a charm containing any number of spell options again. Snapcaster is so modal there are modes to the ways you want to use its modes. 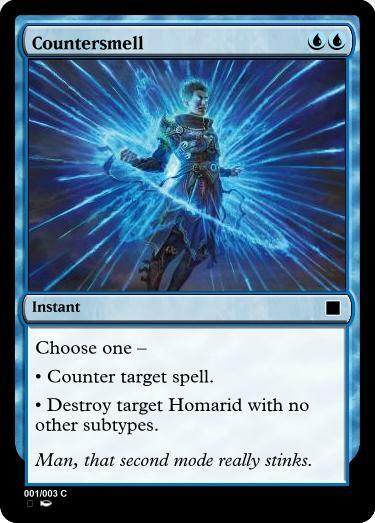 Personally, I think implicitly modal spells are some of the most fun and cool designs Magic has to offer. If you're a Johnny, there’s an interesting deck design challenge to uncovering and unlocking what modes a spell secretly has. For Spikes, it’s extremely skill testing to try and figure out how to use a card when what it really does isn’t even printed on it. Even Timmys, who seem the least likely to have implicitly modal cards designed for them, can get some real enjoyment out of the dramatic moment of one of these cards revealing that it does a lot more than people expect. So implicitly modal cards are great, how do we make as many as possible, and how do we design them to not do screwed up stuff to environments? For the first part, at least some of that design can be done by making room for ‘secret modes’ on existing cards. Allowing removal effects to hit your own things is a good example. Being able to Swords to Plowshares your own creature is a very weak mode, but allowing that mode to exist is a cool secret mode for a player to unlock. That said, we’re seeing with Teferi, Hero of Dominaria how this can go wrong. His secret mode of self-tucking is an excellent example of the sort of powerful lateral thinking usages that Spikes will devise, as well as being a push towards the sort of no-wincon-but-mill control decks that R&D has explicitly said they hate with a fiery passion. That secret mode was cool the first time, but it’s also strong enough, frequent enough, and boring enough that it likely shouldn’t have been printed. Besides that, these ‘single secret mode’ cards aren’t nearly as implicitly modal as full-on implicitly modal cards can be, and off the top of my head I can think of only a handful of truly implicitly modal cards. Snapcaster Mage, Collected Company with at least 3 hits, and Flickerwisp are the most clean cut examples which come to mind. It’s also extremely hard to design these cards because some of their emergent modes are almost by definition not designed in. It’s extremely unlikely whoever designed Flickerwisp was thinking about the prospect of using Aether Vial to Flickerwisp on your opponent’s end step and lock them out of land for countermagic, and it’s outright impossible that they thought about things like using Flickerwisp to protect or reset a Planeswalker, or to get cards in exile for something like Wasteland Strangler. There’s an argument to be made that tutoring effects like Birthing Pod and Stoneforge Mystic should be considered implicitly modal in the same way, but I think the fact that you get all possible choices every time is worrisome. Getting every choice every time tends to lead to one choice, like a Siege Rhino or Batterskull, just always being correct. I think the more modern design of implicitly modal cards that have only some of their modes, and that have much more demanding constraints to unlock additional modes, is weaker, but ultimately more interesting to both play with and play against. • Look for and discuss examples of implicitly modal cards that I didn't mention, and discuss whether you think tutoring is a form of implicit modality, and to what extent you think we should encourage tutoring because of that. • Discuss what things you think different implicitly modal cards share, and how you think those shared features can be used to increase your chances of successfully designing an implicitly modal card. With any luck, I’ll be joining you in the comments on Reddit. I’ll be slightly busy this weekend sleeving up for GP Denver side events, but I’ll do my best to help the discussion along. If you're at the GP, don't hesitate to say hi. Markus is an L1 Judge, a programmer, a game modder, and a Spike. He lives in Boulder, Colorado, and plays primarily Modern and Pauper. If you want to tilt him, ask about the mechanic Cipher. Josh Moore returns with another update video on his paper Momir project. Monthly update for October covering changes to the Cardsphere team, development updates, GP Montreal, and much more.